Confirmation of retirement letter to employee. Retirement letter to employee thank you. Retirement letter to coworkers. Sample retirement letter for government employee. Retirement letter samples for someone retiring. I am writing to you because I would like to discuss you notification of retirement. As you have reached the retirement age this is your formal notification letter to retire. I would also like to say that during the thirty years that you have been working for us that we have never had someone like you who has worked so hard and for so long as well. You have made a good reputation inside this company and you will have that for as long as this company is running you will be remembered in the history of this company. I hope that you will enjoy your free time with your wife, kids and grand-kids. Make more and more memories with them while you have the time and don’t forget you are a great person. You have given your productive years to the company with full devotion and maximum output, and you have always followed the rules of company without questioning them for personal gains. Now it is the time that the company should shake hands with you with full respect and grant you the retirement. No doubt your presence would be missed but as a matter of age retirement is inevitable now. Sample notice to clients of office closed during the annual day, festival, games, holidays, vacations, emergency or any other reason. 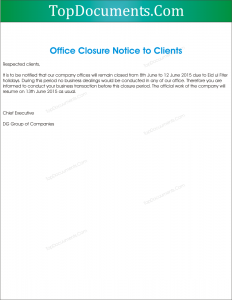 It is to be notified that our company offices will remain closed from 8th June to 12 June 2015 due to Eid ul Fiter holidays. During this period no business dealings would be conducted in any of our office. 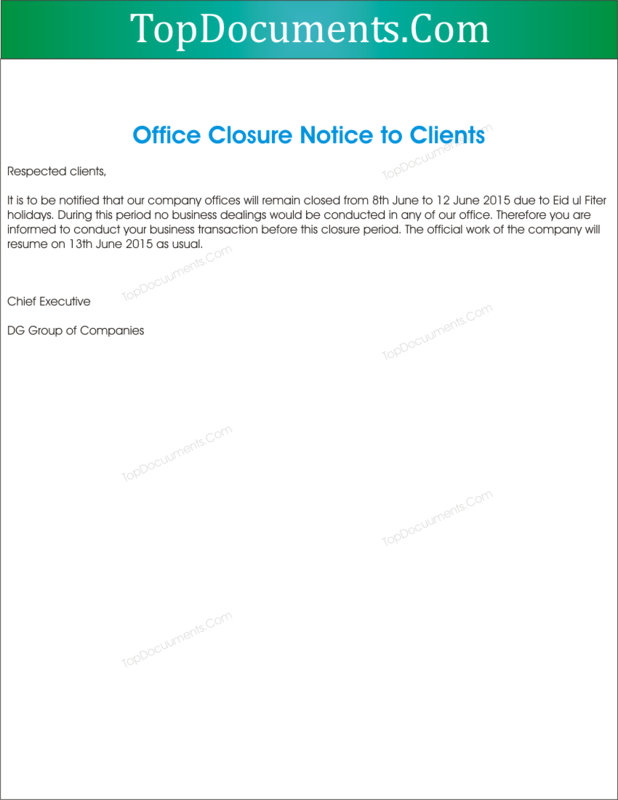 Therefore you are informed to conduct your business transaction before this closure period. The official work of the company will resume on 13th June 2015 as usual. It is being informed in the best interest of all the concerned stakeholders that our head office situated at Chicago shall remain closed for three days i.e. 19th to 21st June for annual maintenance and renovation purpose. All the relevant parties are advised to schedule their appointments of any sort accordingly as staff will be absent on these days. Office shall be working again as before from 22nd June. We apologize for any inconvenience it may cause and we are grateful for your cooperation. This is to inform you that our transport business will be temporarily closed for almost 6 months from 1st January 2019. However, I cannot tell you the exact time period as it might last longer than this. The reason behind this is that the CEO will not be available due to some personal reasons and can’t leave the company without anyone to look after it. I am sorry to all of you who do not have any alternative source of income but, fortunately the CEO has decided to give us extra salary of a month which will definitely make things a little bit easier. When the business will be reopened, all of you will be hired back but if anyone do not want to rejoin then we understand. For any queries or clarification, feel free to contact me. Thank you. Sample Email Notification for Annual Leave to staff members, managers, director, CEO of company, school etc or your personal contacts of business. I will be on Annual Leaves from Dec 22, till Jan 08, 2012. I will have limited access to phone & emails during this period. Please contact the following personnels incase of immediate assistance. I will be on Eid holidays from 3rd till 11th Oct, during this period I will have limited access to my emails. I will reply to your emails on my return to office on 12th Oct. 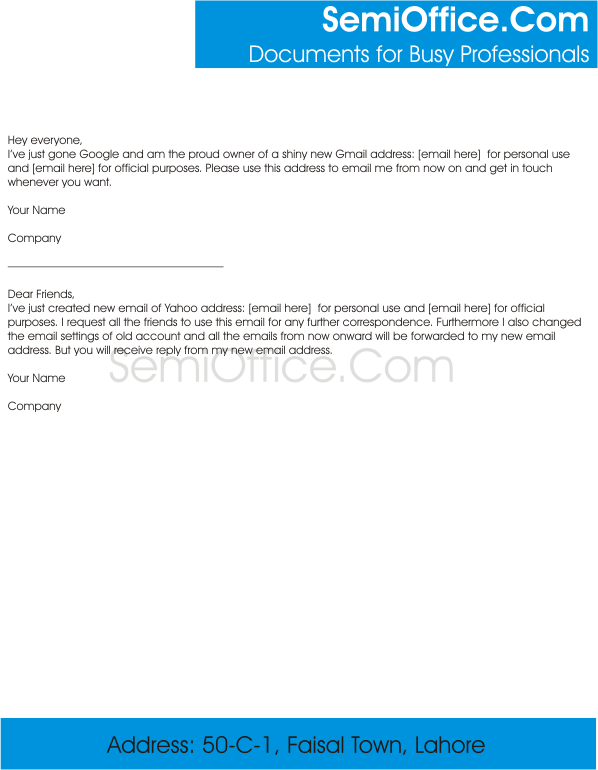 Sample holiday notification format for issuing office holiday notice to employees. 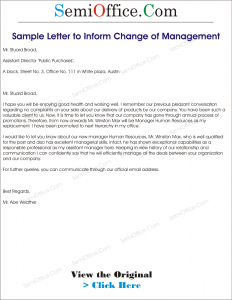 Annual leave notice sample format for offices, schools, colleges and universities, hospitals etc. SemiOffice Group DHA and Gulberg Lahore offices will remain closed on Thursday 3rd January 2017 on account of “New Year Celebration Ceremony” at Johar Event Complex. It is to inform you on the behalf of Senior Vice president British Oil Company that there has been a holiday announced in the company on 25th of December 2016 to 28th of December 2016. The holiday is from the government under the act AS401 on the eve of Holy Christmas. It is to hereby inform all the employees that the firm shall remain closed throughout entire span of time mentioned above. The firm will reopen from 28th of December 2016 under normal working time. I wish you and your family all the best on this great eve of joy. May God’s blessings be upon us. Farewell to all the employees. 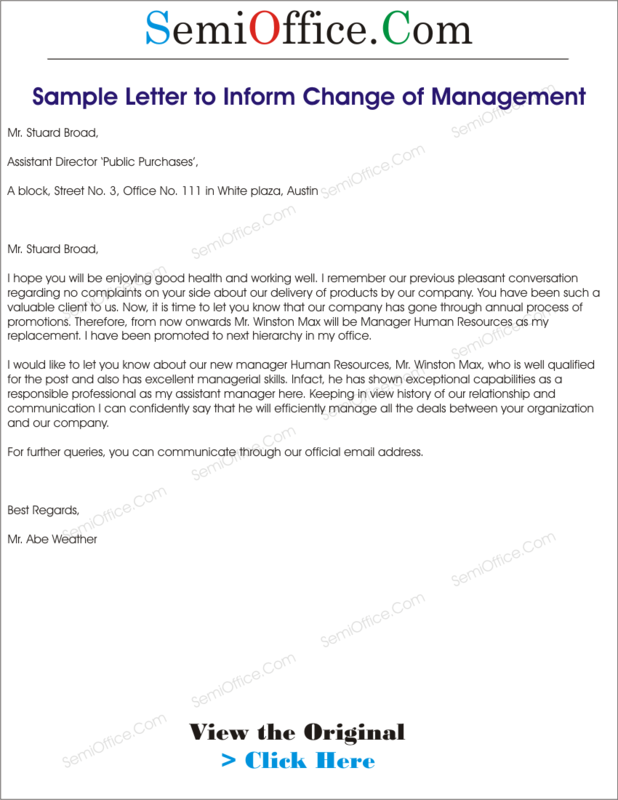 Sample Office Order For Leave in office, factory or production units and mills Free Download. Sample Office order for announcing vocations or official holidays for staff and employees. Administration staff of Zainab Corp will be on holidays from Tuesday 15 October to 19th October 2017 (Inclusive) on account of Eid-ul-Azha. Designated Staff Production units and Security will however attend to their duties according to schedule. A happy Eid to all the members of Staff. Sample notification for change of email address to your contacts of previous email. Simple copy the message read it once and send it to all of your contacts. You can set auto reply by posting this message in yourr email account for email senders. I’ve just gone Google and am the proud owner of a shiny new Gmail address: [email here] for personal use and [email here] for official purposes. Please use this address to email me from now on and get in touch whenever you want. I’ve just created new email of Yahoo address: [email here] for personal use and [email here] for official purposes. I request all the friends to use this email for any further correspondence. Furthermore I also changed the email settings of old account and all the emails from now onward will be forwarded to my new email address. But you will receive reply from my new email address. I have recently changed my email address as I could not access the previous one due to security issues. I tried to recover it but all the efforts went in vain. As I work in Public Relations department, most of my work is on done through emails. My new email address is alihaider@gmail.com , and I would like you to kindly change it as soon as possible so I do not miss out on more emails. Also, as I lost my account on 2nd February, so I request you to kindly resend me the mails sent after this time on my new email address so I can catch up with the missed work.